Dental implant is the replacement for the root portion of natural tooth and is anchored into a pre-drilled socket in your jaw-bone to support crown, bridge or secure a denture firmly in place. Implants are made from titanium, a material that is well tolerated by bone and integrates easily with bone tissue. During the placement of a dental implant the goal is to achieve a close contact between the outer surface of the implant and the surrounding bone tissue so they can fuse together (osseointegration) creating a stable support for the new teeth. In general, dental implant works are required two trips to Pattaya and Thailand. Your first trip is for implant body placement and takes around seven days in Pattaya. You will get temporary crowns back to your home. That means there is no missing teeth while you smile and our dentist will provide temporary crown that good enough for not be noticed by your friends and families. Then, you come back Pattaya again 2nd trip another week for permanent crowns when implant body properly fuse to your bone after 10-12 weeks. 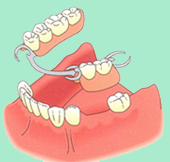 There is also immediate implant option but can be applied with some patients only. It takes 7-10 days for all processes. Cost: 47,000 Thai Baht per one implant and one crown on implant. 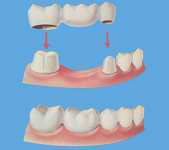 Dental implant should be indistinguishable from your surrounding natural teeth. Dentures can come loose and look un-natural if they do not blend with your gums and some bridges and dentures have unsightly metal clasps to hold them in place. Dental implants provide a much better cosmetic and functional end result. 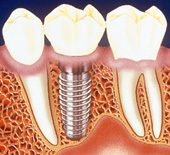 Traditionally, implant will be placed into your bone to support a single crown known as Single Tooth Implant. However if you have several missing teeth you do not necessarily need an implant for every missing tooth, one implant can support several teeth via a bridge or a denture. The number of implants required depends on the volume and density of bone tissue available at each implant site. Often smaller sized mini implants are used to secure dentures in place. In the case of full mouth reconstructions where an arch of several teeth (10+) need to be supported in either the upper or lower jaw a minimum of 5-6 implants in each jaw would be required. The exact number of implants needed would depend on the individual case and Dentist @ Beach would be able to advise you on the best solution after a through examination and assessment in Pattaya.